This didn't turn out quite as fabulously as I'd hoped but since I really couldn't picture the complete end result in my mind, I'm not particularly disappointed. It still needs something but I'm not sure what and again, for a first try, I'm generally happy with it and what I learned in the process. Such a cute card! Love the shaker jar- the sequins are so pretty! This is just awesome! I have only made a few myself, but this is well done! I like it so pretty! Super shaker card! Nothing to be disappointed with there! I love the sequins in the shaker! Thanks for playing along with us at Shopping Our Stash!! I've had the same thought that these jars would make a cute shaker card. You beat me to it! Very cute! I think it's pretty darn great. Love the shaker jar, this is adorable! Great shaker card. Fun design and great colors. Very fun and happy card! This card is so fun! I live the shaker cards and it works perfect for birthdays. Thanks for playing along at the SRM challenge! this is so cute! i love your shaker! Love the card! The shaker box steals the show! What a fun shaker card! Thanks for joining us at Shopping Our Stash this week! PS: If you think it needs something, what about baker's twine around the jar lids (or maybe just the middle one)? What an awesome card, and it's super great for a first try! I've never made a shaker card before but would love to try. Yours is terrific! I guess we always end up with something different from what we have a mind. My husband always tells me the nobody else knows and that is why every project is a work of art...unique. This is so sweet! 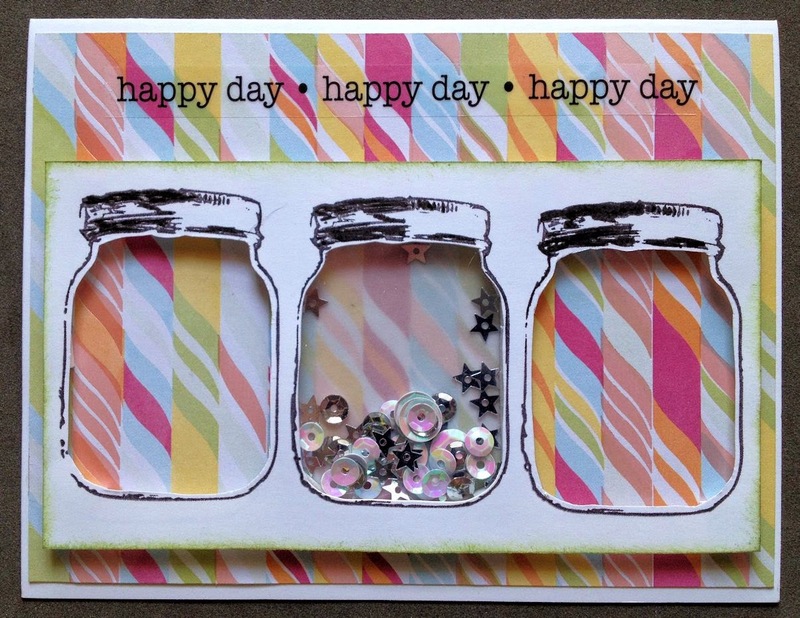 Love the sequins in the jar! Thanks for playing with us at The SRM Challenge! I love your card and congrats for winning top three on the challenge blog. I think if your card needs anything(which I don't think it does--it is so cute) maybe some twine around the jar lids would be adorable. And if you wanted the jars to have different colors you could layer different paper under each jar. But, I would absolutely LOVE this card in my mailbox!! What a great shaker card, totally love it! Thanks for stopping by my blog. I think it looks great! Thanks for stopping by my blog as part of the Refresh blog hop!